Castleford Tigers will go into the Super Eights 10 points clear after overcoming a Catalans Dragons fightback and being down to 11 men at one stage to win 32-24 in France. Daryl Powell’s men also had to overcome some strange refereeing from Phil Bentham and video official Robert Hicks that threatened to derail their unbeaten run, but kept their nerve superbly to finish the stronger. Late tries by Jy Hitchcox and Paul McShane sealed a win that did not look likely when everything seems to be going against the Tigers in the second half. Cas let a 14-point lead slip to be two points behind at half-time after Catalans produced some of the free flowing rugby for which they were known before this season - and were helped by a few decisions from referee Phil Bentham and video referee Robert Hicks. The Tigers were ahead from the ninth minute when Grant Millington’s offload gave them good field position and the ball was moved left to Jy Hitchcox who showed good speed before producing a flying leap to score at ry goaled by Luke Gale. A 40-20 by Gale kept the pressure on and Gale kicked a penalty to stretch the lead to 8-0. It was 14-0 on 18 minutes as Zak Hardaker produced a moment of magic. Taking the ball deep in his own half from a scrum, he spotted a gap on the outside and raced through it before charging 90 metres downfield for a great try, again goaled by Gale. Catalans were given a lifeline soon after, however, when Julian Bousquet’s offload was collected by Lucas Albert who charged over for a try converted by Tony Gigot. A big decision soon after went the Dragons’ way when it should have been a penalty to Cas as Paul McShane was tackled late then pushed to the ground. He reacted and was penalised when the decision was handed on to the video referee. From the resulting set the hosts scored again when Gigot went over from Kristian Inu’s pass and added the goal. Catalans were now in full flow and went ahead as Fouad Yaha finished strongly in the corner. Another goal by Gigot made it 18-14. Cas did reduced the deficit right on the hooter as Hardaker kicked a penalty from just over the half-way line to make it 18-16 at half-time. Both teams were guilty of making handling errors at the start of the second half and the Tigers missed a great chance when Alex Foster raced over only to be pulled back correctly for a forward pass by Gale. There was no stopping Greg Minikin soon after, however, as he got the ball when Gale’s high kick was knocked back by Joel Monaghan and he produced a clever kick ahead then reached the ball first for a smart try that was again goaled by Gale. The wheels appeared to come off after that with the officials seemingly looking to punish the Tigers at every opportunity. Kevin Larroyer appeared to be correctly punished as he put his hands where he should not in making a tackle and was sin-binned. While down to 12 men further penalties that were not so clear cut were given against Cas and they were put on a team warning. Mike McMeeken was the unlucky second man to be yellow carded in this period for being the wrong man in the wrong place and judged to have offended in a tackle. 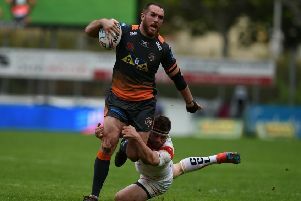 Catalans forced the pressure as expected with their extra two men, but the Tigers produced some heroic defence with Paul Aiton, Thibaut Margalet and Louis Anderson all held up over the line. Vincent Duport then dropped the ball over the line , but after endless TV replays a penalty try was controversially awarded by the video referee as Hardaker was judged to have gone in with his feet even though he did not appear to touch the ball. With Gigot now handed a kick under the posts instead of on the touchline he kicked the goal to put the Dragons back in front. Cas could have sulked about all the things going against them, but they redoubled their efforts and came up with two tries in the last six minutes to seal their 20th victory of the regular season. After McShane was unlucky to see a try disallowed after he went over from a high kick that seemed to be knocked forward off a home player, the Tigers were still undeterred and Michael Shenton found Hitchcox who produced a spectacular dive for his second well taken try of the night. Gale goaled from the touchline to make it 28-24. Then the match winner followed as McShane scrambled over smartly after the ball had bounced off a Dragons player when he blocked a kick through. It was not clear, but it seemed Gale was sin-binned as well after the winning try, presumably for something he said to the officials. There may not seemed to be a huge amount at stake before the game, but in the circumstances this turned out to be one Castleford’s best wins of this memorable season. Scorers - Catalans: Tries Albert, Gigot, Yaha, penalty try; goals Gigot 4. Castleford: Tries: Hitchcox 2, Hardaker, Minikin, McShane. Goals: Gale 5, Hardaker. Catalans Dragons: Gigot; Tierney, Inu, Duport, Yaha; Albert, Myler; Moa, Aiton, Navarrete, Anderson, Horo, Bird. Subs: Bousquet, Garcia, Baitieri, Margalet. Castleford Tigers: Hardaker; Monaghan, Minikin, Shenton, Hitchcox; Roberts, Gale; Millington, McShane, Sene-Lefao, Foster, McMeeken, Massey. Subs: Lynch, Cook, T Holmes, Larroyer.